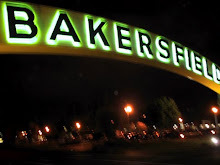 Bakersfield Observed: Valley fever cases spike, there's a push to kill the high speed rail project and The Bakersfield Californian endorses the anti-fossil fuel candidate Gavin Newsom for governor. Really. 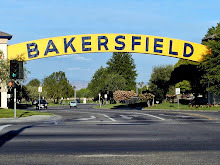 Valley fever cases spike, there's a push to kill the high speed rail project and The Bakersfield Californian endorses the anti-fossil fuel candidate Gavin Newsom for governor. Really. worst year yet. In 2016, there were more than 6,000 cases reported - then a record - but in 2017 that jumped to 8,103. Through August this year, we have had more than 5,000 cases and were are entering the peak season for valley fever infections to emerge. And, experts say valley fever is spreading to areas well outside the Central Valley, with many cases being reported in places like Monterey, Los Angeles and San Luis Obispo counties. 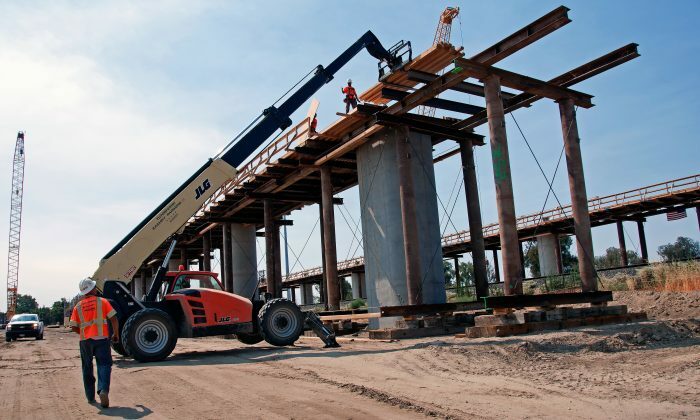 * ... HIGH SPEED RAIL: Here is one emerging state initiative that I can get behind: there is a push to put an initiative on the 2020 ballot to kill the high-speed rail project. The same people who were behind the initiative to kill the gas tax - that will appear on the November ballot - are pushing the high speed rail effort. The high speed rail project is grossly over budget and honestly, do you really believe it will be completed in our lifetime? I can think of a thousand better ways to spend that money. 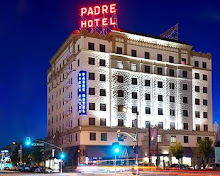 * ... OVERHEARD: One friend to another: "I don't know which is worse: the (homeless) people outside the downtown Rite-Aid or those inside it." * ... HOMELESS IN LAUREL GLEN: A family in Laurel Glen awoke last week to find a homeless woman living in their back yard by the pool. 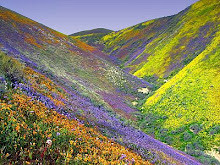 The woman, middle aged and disoriented, had makeshift bedding and had made herself at home. When asked to leave, she became belligerent. The family had no idea how long she had been there. * ... GAVIN NEWSOM? 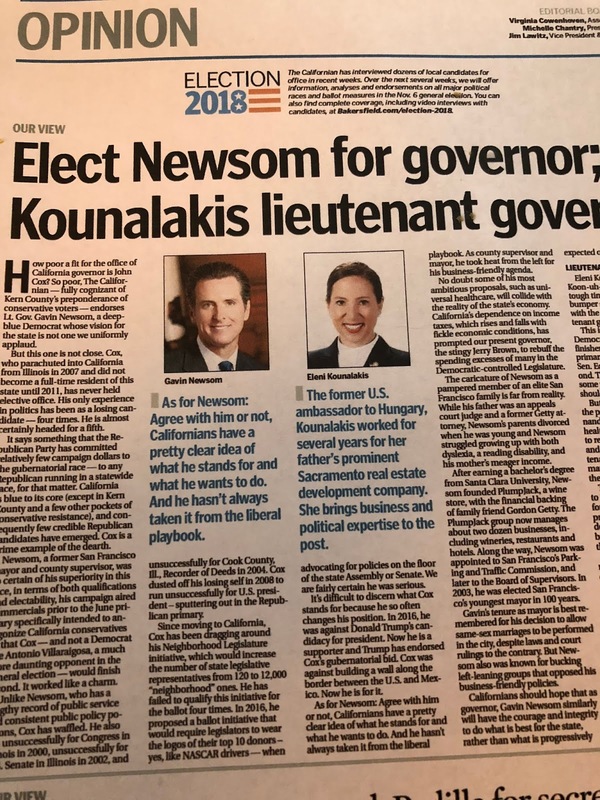 I was stunned to see that my old employer, The Bakersfield Californian, endorsed Gavin Newsom for governor. 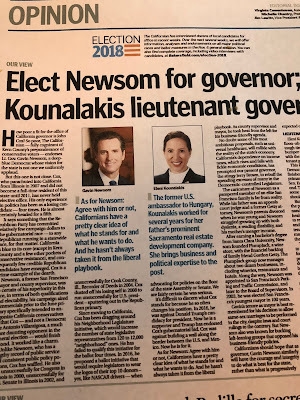 Not only did the paper endorse Newsom, but it did so enthusiastically. Count me among those who just don't get it. Republican John Cox may lack experience, but Newsom is so clearly out of step with Kern County - think single-payer health care, sanctuary cities, opposition to oil and gas drilling and support for high speed rail - that it seems TBC did the journalistic equivalent of dousing itself with gasoline and lighting the match. Good luck with that. 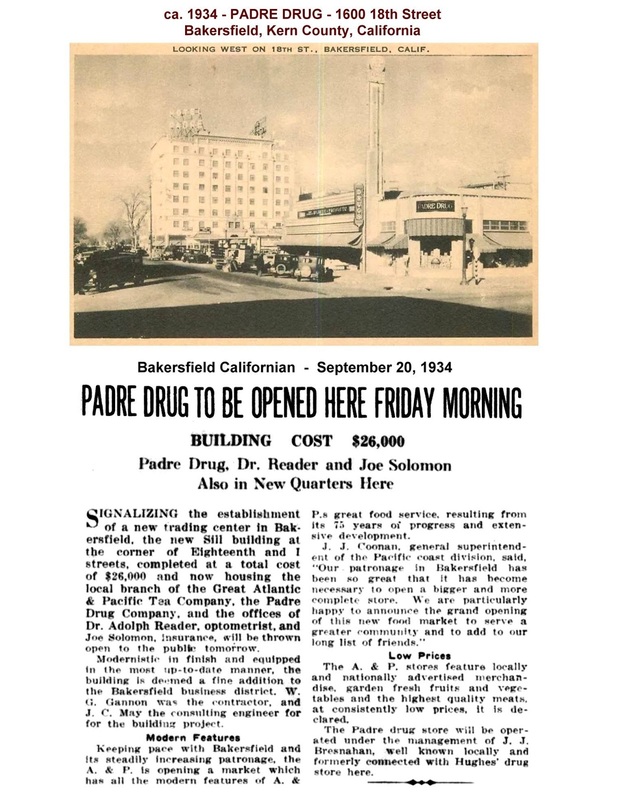 * ... MEMORIES: Who remembers the old Padre Drug store? Check out this remarkable old picture. "I have seen a number of posts that deal with two ideas: 1) Dr. Blasey Ford would be called hysterical if she lost her temper and behaved as Judge Kavanaugh did, and 2) Judge Kavanaugh’s anger proves he is not fit to serve on the court. Let me offer two thoughts on those two thoughts. And I would welcome your thoughts. Dr. Blasey Ford would have been labeled as “emotional and hysterical” if she had done what Judge Kavanaugh did. Undoubtedly true. But by whom? Who would have described her this way? Politicians? Conservative talk show hosts? Who cares? I saw a person who has been deeply hurt – both by the sexual assault and the relentless media spotlight that we empower. She reverted to the training that so many women have received – keep quiet, stay under control, be a good girl, don’t lose your temper. I felt so sorry for her and her family because they are in a lot of pain. I wish her well and a return to her normal life as soon as that is possible, if it’s possible. I understand that she is a marvelous professor and a brilliant researcher. I believe that. “Judge Kavanaugh is a rage-aholic and this proves we can’t trust him on the bench.” The record shows otherwise. All of his disinterested reviews from the ABA and fellow jurists show he is a measured, thoughtful judge who carefully researches the facts and rules on them, not emotion. There are no incidents of rage or anger in his professional life. I saw a person who has been deeply hurt and was responding according to his training. From an early age, most boys are taught to fight back with all the anger and strength you can muster. Never accept defeat. Defend your family and your honor and do it loud. I felt sorry for him and for his family. They’re all in a lot of pain. If I ever had a case before him, I think it would be adjudicated fairly and according to the law. For now, I am going to leave out my comments on the political pandering I saw from both sides yesterday. I don’t know how this vote is going to turn out. I don’t know exactly what happened that summer of 1982. We live in a culture of relativism, unfortunately, and I saw too many posts from friends who merely parsed the portions of the testimony that fit their notions before the hearing. I know that there are two people who responded yesterday as we have trained them in modern America and I am going to pray to God to give both of these people and their families some peace. That was one of the worst days in America’s political history."